A Geographic Information System, or GIS, is a computer-based system to collect, organizes, manage, analyze and display the geographical data. 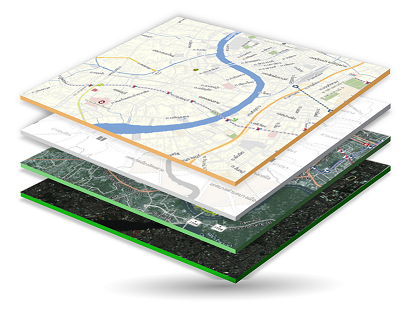 GIS is recognized as an excellent tool to solve real world problems. Policy makers, planners, and researchers from a wide variety of fields take advantages of decision making capabilities of GIS. GIS as one of the fastest growing technology, generates a large number of opportunities in both public and private sector every year. 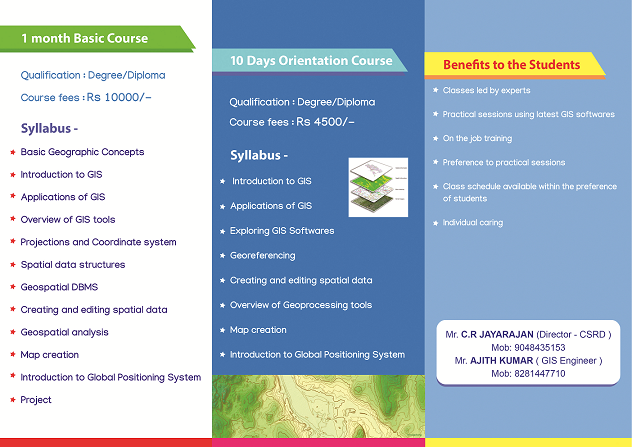 To utilize these opportunities, one must have strong knowledge about the basic concepts of GIS. ​ CSRD is an NGO, situated at Pudukkad of Thrissur District, the cultural capital of Kerala. We are dealing with various Central and State government projects relating to Water Supply, Natural Resource Management etc. We have more than 7 years of experience in implementation of GIS in various projects like Watershed Management, River Bank Mapping, Asset Mapping etc. During all these years we have gained tremendous amount of knowledge in GIS, so we decided to start short term courses for GIS aspirants. We not only consider in gaining knowledge but also believe in sharing of knowledge. Our students may get the opportunity to participate in ongoing projects, where they can learn GIS in a practical environment.